Today’s garages can be so much more than just a dusty place to park your car. Modern garage designs offer you the luxury of clean, attractive, and efficient workspaces, storage spaces, showcase spaces, and more. Cossentino and Sons can build a garage that does much more than keep the elements off of your car, motorcycle, or boat – we create a fully finished room with all of the comforts of home! At Cossentino, we believe in communicating with our clients, and our first meeting with you will be dedicated to finding out exactly what you envision. Our owner, Wayne Cossentino, has been a licensed contractor for more than 30 years, and can answer your questions while providing his own insight and knowledge. Working with a professional virtually guarantees a successful project. After the initial meeting is complete, you will receive an accurate proposal that includes budget figures based on our discussion. Once the budget has been established and approved, the next step involves the design and architectural drawings of the garage you have always dreamed about. You will work closely with our architect to not only realize your dream come true, but to stay on budget. Cossentino and Sons applies for the necessary government permits so you have one less thing to worry about. Our quality carpentry crew, project manager, and owner are veterans of the construction business and handle the entire process. They are professionals who are dedicated to their craft – they do not cut corners or rush to complete a job. Turn to a contractor who knows the technicalities involved in creating a custom garage addition or custom detached garage addition just for you — and drive in to a garage you’re excited to come home to. Cossentino and Sons is based in Howard County and we service customers in Baltimore, Carroll, and Anne Arundel counties, along with parts of Northern Montgomery County. 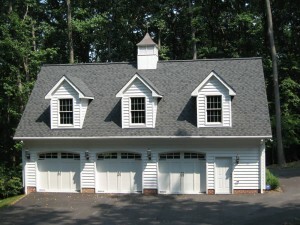 If you want a garage that will be the envy of your neighbors, and are interested in working with experienced professionals who pay attention to detail, contact us today at (410) 442-0000 or email us today.